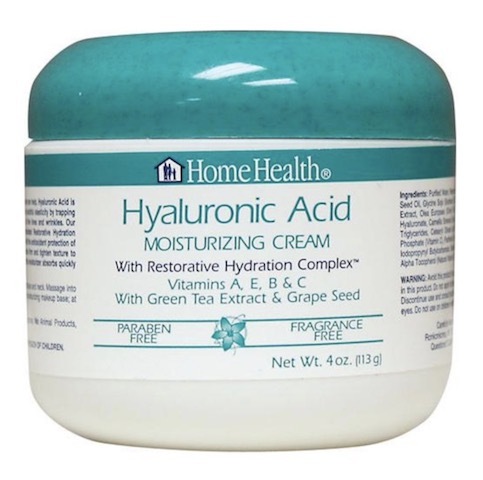 Promote healthy skin with Hyaluronic Acid Moisturizing Cream from Home Health. Hyaluronic acid is naturally found in skin, where it maintains elasticity by trapping moisture. Home Health's cream features a specially formulated Restorative Hydration Complex with nourishing botanicals, including green tea extract and grape seed oil. Hyaluronic acid products have rejuvenating vitamins that improve skin texture and radiance. Gentle enough for all skin types, this moisturizer absorbs quickly. No parabens, petroleum, artificial color, fragrance, animal products or gluten. Directions: Apply a small amount to a thoroughly cleansed face and neck. Massage into skin using gentle, upward strokes. Use in the morning as a moisturizing makeup base; at night as a nourishing night cream. Ingredients: Purified water, Restorative Hydration Complex™ [Vitis vinifera (grape) seed oil, Glycine soja (soybean) oil (and) Chamomilla recutita (matricaria) flower extract, Olea europaea (olive) fruit oil, Aloe barbadensis leaf extract, sodium hyaluronate, Camellia sinensis (green tea) extract], caprylic/capric/myristic/stearic triglycerides, cetearyl olivate (and) sorbitan olivate, glycerin, sodium ascorbyl phosphate (vitamin C), panthenol (vitamin B5), dimethicone, diazolidinyl urea (and) iodopropynyl butylcarbamate, sodium magnesium silicate, bisabolol, citric acid, d-alpha tocopherol (natural vitamin E), disodium EDTA, retinyl palmitate (vitamin A). Warning: Avoid this product if you are allergic or sensitive to any of the ingredients in this product. Do not apply to broken or irritated skin or areas affected by rashes. Discontinue use and consult your doctor if skin sensitivity occurs. Avoid contact with eyes. Do not use on children or animals. For external use only. Do not ingest. Keep out of reach of children. Store in a dry place and avoid excessive heat.